Kristine Papillon's new audio book follow the musical tale of a baby trumpet unable to fall asleep. Thanks to Fort Wayne Philharmonic violinist, Kristine Papillon, there's a new children's audio book on the horizon, called "Crumpet the Trumpet." Its purpose is to introduce young folks to the world of classical music, by way of a sweet and funny bedtime story. The book features illustrations by the author, a soundtrack showcasing 32 musicians, and narration by Fort Wayne Philharmonic Maestro Andrew Constantine. It will make its premiere this Sunday afternoon, when the Orchestra performs the soundtrack live at their family concert. WBOI's Julia Meek met with Papillon earlier this week to discuss her adventures in making this melodious project come together. 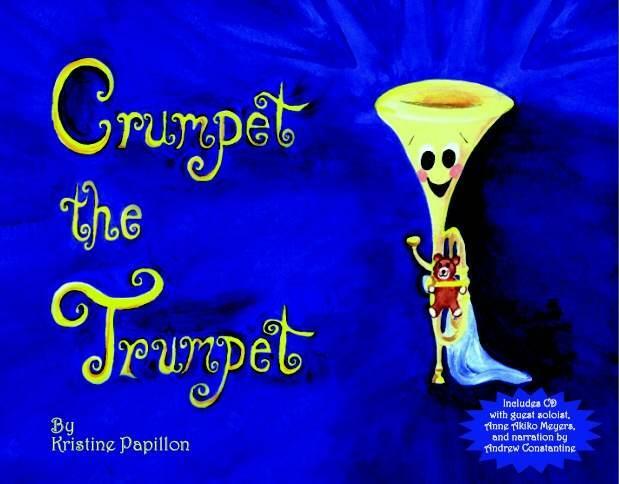 Hear Julia Meek's interview with Kristine Papillon, author of "Crumpet the Trumpet." "Clerical Errors" is an all new, faith-based action comedy from writer/director David Matthew Weese of Blended Planet Pictures. This family-friendly indie film was created and produced right here in Fort Wayne, and its world premiere is set for Friday at Carmike Jefferson Pointe. Don "Donny O" Offerle stars as Vinny, a bad guy with a good heart, who takes the wrong turn on the crooked path to easy street. APQ Sounds Off at "Ground Level"
The Alicia Pyle Quartet's unique fusion style of music has been claiming fans here in Northeast Indiana for nearly five years. This weekend, they are celebrating their place in the music scene with their first album, called "Ground Level." Adding to the diverse textures provided by core APQ members Brad Kuhns, Derek Reeves and Jose Morales, "Ground Level" features sit-in performances by Jane Heald, Rachel Mossburg, Kimball Glaspie and John Forbing. First Presbyterian Theater is readying its first production of the new year: a dramatic comedy by Evan Smith from 2009 called The Savannah Disputation. Director Thom Hofrichter feels certain that this production, starring Meg Brouwer, Christi Campbell, Nancy Kartholl and John Brouwer will make audiences think -- and laugh. WBOI's Julia Meek met with Hofrichter to learn how theology and humor go hand in hand. Many additions were made to Fort Wayne's visual landscape in 2014, and seemingly, sculptures have stolen the spotlight, and are springing up all over. Everything from the restoration of the much-debated Helmholtz sculpture to the placement of the Anthony Wayne statue kept the role of public art in the news for much of the year. Since it's the holiday season and we're in a playful mood, we're just going to come out and say it: toys rule! It seems everyone has a memory of a favorite childhood toy: a doll, a truck, a ball or a game that brings warm memories immediately to the surface. But toys and the play they inspire have been around for thousands of years, dating back to prehistory. And while the types and packaging may have changed, the point -- having fun and learning -- has not.